— George Lucas, ‘The Making of Star Wars’ p105. The Tatooine equivalent to American Graffiti's hotrod cruisers, Luke's landspeeder is yet another very distinct vehicle design from Star Wars. 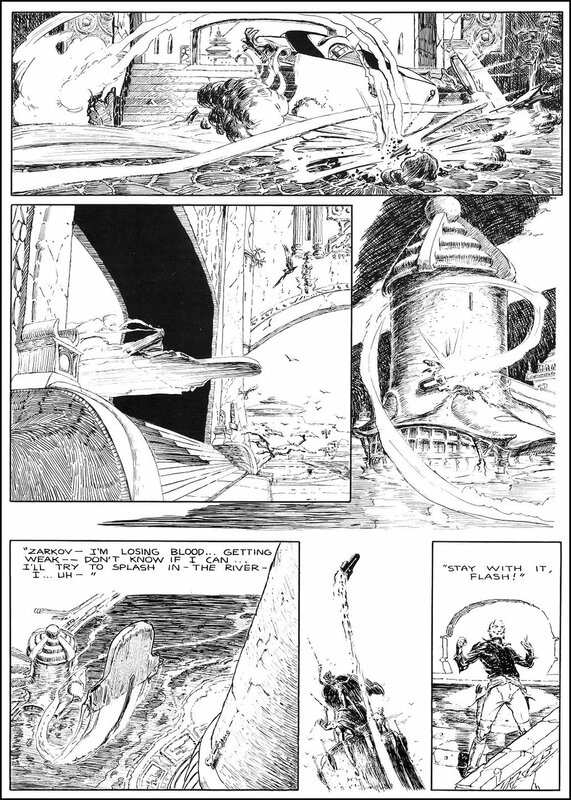 It went through a couple of iterations, including Colin Cantwell's more autrere disk-like design, although the landspeeder seen in the final film seemingly owes only the color to Cantwell's work. Colin Cantwell's land speeder, photo by dsatterth. 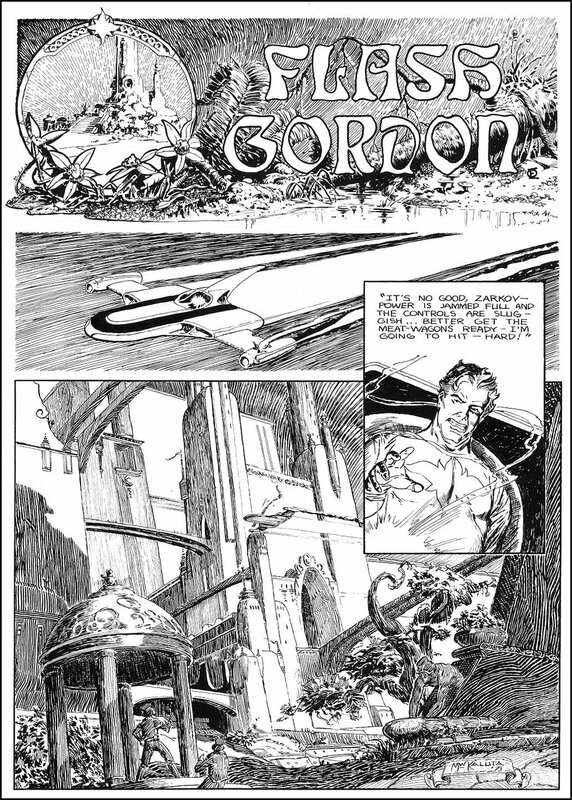 However, the design seems to mostly bear a remarkable similarity to the design of the craft flown (and crashed) by Flash Gordon in this four-page story by Michael W. Kaluta from 1971. Notice in partitular the U-shaped nose and how the U-shaped sides don't meet at the front. The turbine-like engines on the sides, the cockpit near the rear and the fin, which in *Star Wars's* case got an extra engine throw onto it. 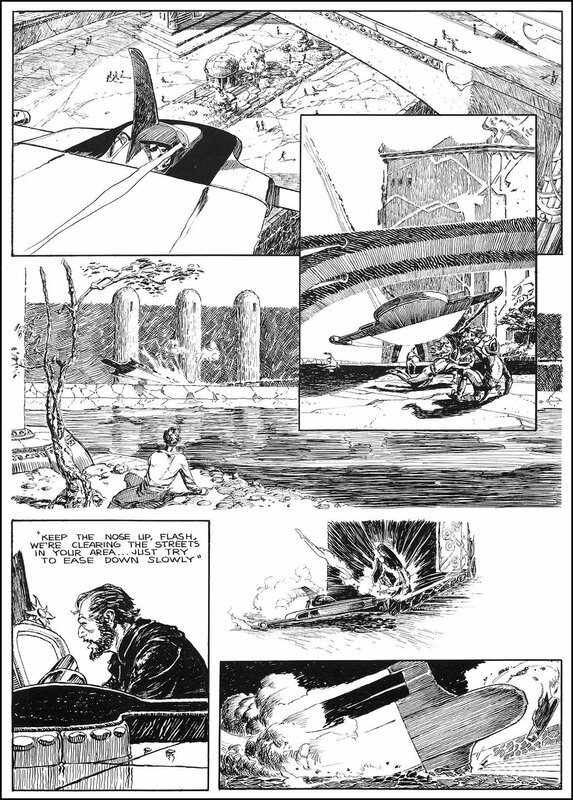 "The land speeder was based on a lot of ideas and drawings I had seen." Lucas says. "I described what it was and I showed Ralph a lot of pictures of things that were close to what I wanted, from comic books and science-fiction novels, and strange things out of National Geographic or some industrial magazines of an interesting design--say a door handle that looks like a spaceship." 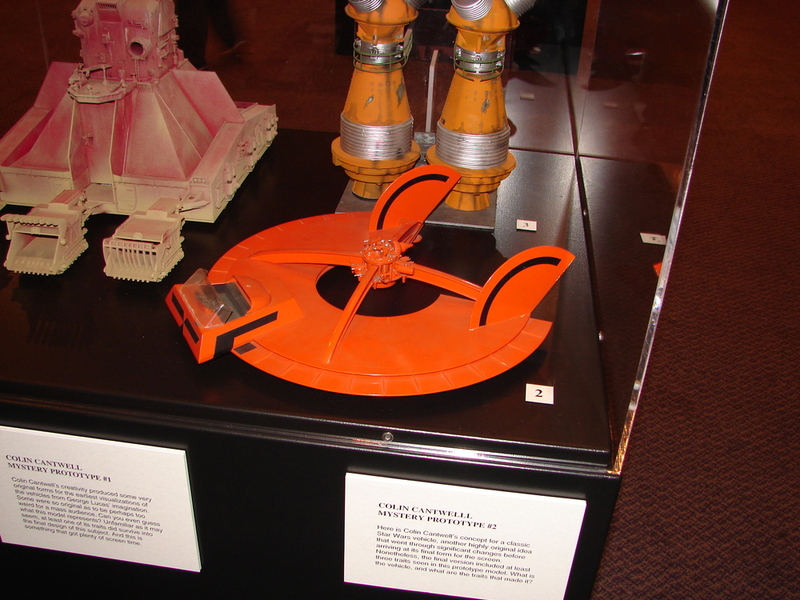 The landspeeder went through several iterations before coalescing in the painting: McQuarrie did sketches, and Cantwell built a concept model (below). "This is a show George wanted." McQuarrie says. "He wanted them on the cliff where they first view Mos Eisley. We knew it was going to be a matte painting, that it was to have two suns. George also wanted the car floating, so I took this point of view and thought it would be kind of interesting if you didn't actually see the ground. Luke was a girl here, and she's carrying that big long rifle, which George wanted. It was one of the things he liked." (p42, Making of Star Wars). McQuarrie's design indeed does look like the finished landspeeder, but someone in the modeling department didn't get the memo, because the final vehicle owes more to Flash Gordon than McQuarrie.